Nyla, as you can see from this picture, you were about 1 month plus here. "Best" age ever. I have a damn good reason for getting that cheapo laptop. 1) You would drool on it. 2) You would bang on the keyboard. I remember always planting my nose in your mouth everytime you uttered a word. I was addicted to your breath.-Daddy. Nyla, I remember this picture very well. I snapped this while we were on the way home from Jurong Point. We had breakfast together. My first MRT ride with you. I enjoyed it so much I brought you to Jurong Point again on that same day after you woke up from your nap. - Mommy. Mommy was conducting tuition when I realised that you were unusually quiet. I thought you were probably doing some colouring or something and then I saw you pray. I quickly grabbed my phone and clicked away. Nyla, you have no idea how touched Mommy was. I don't know how many 'rakaat' you did or whether you took 'wudhu' but Mommy's heart was swelling with pride, baby. May you grow up to be an anak yang solehah. Insyallah. You may have tangible wealth untold. As a homemaker who settled our school stuff, drove us to school/enrichment centres, cooked our favourite food, my mother also used to read to me and my brothers every night. I still remember how we would lay on our mattreses and listen to her intently. We had a library corner at my childhood home over at West Coast Park. The huge book shelf was grey and my mom added rugs and big pillows at our cosy library area. What I am as a parent today, I owe it to my mother. Whatever she did with me back then, I do it with Nyla now. Only that I improvise a teeny weeny bit and instead of just reading together, Nyla and I write books together. Finally peeps, Chickchickaboomz is on sale! Thank you my readers for waiting ever so patiently. 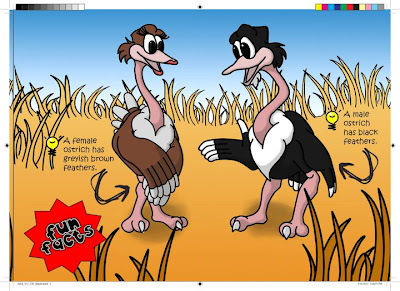 Other than educating young children to harness their own unique strengths, it also teaches fun scientific facts related to ostriches. A copy of Chickchickaboomz is just $14! 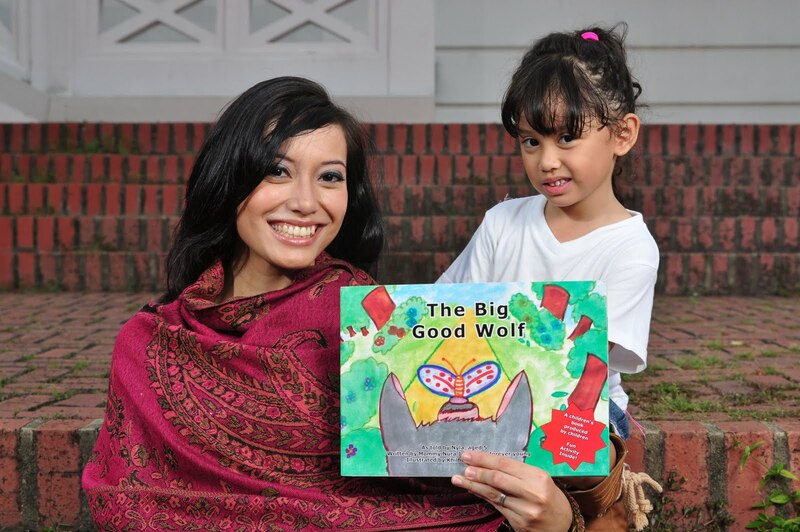 And we have also printed additional copies of The Big Good Wolf so feel free to order as well! Going at a special price of $10! I personally believe that the best present to give to a child is a book because stories encourage bonding between parents and children....books enhance a child's language skills. Together, let's raise readers for according to Emilie Buchwald, "Children are made readers on the laps of their parents" and also, let's listen to Roald Dahl who said, "So please, oh PLEASE, we beg, we pray, Go throw your TV set away, And in its place, you can install, A lovely bookshelf on the wall"
There are many ways to enlarge a child's world and in my case, the love of books has certainly benefitted Nyla (and myself) tremendously. 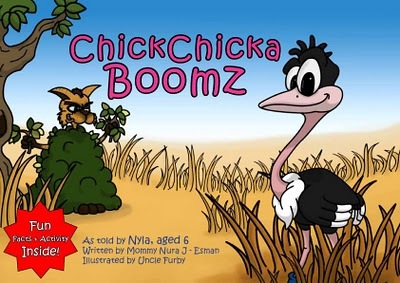 To add Chickchickaboomz and The Big Good Wolf on your book shelf, do email me at nuraesman@gmail.com. My sister in law, Netty has 2 sisters. Like her, they are exceptionally gifted. 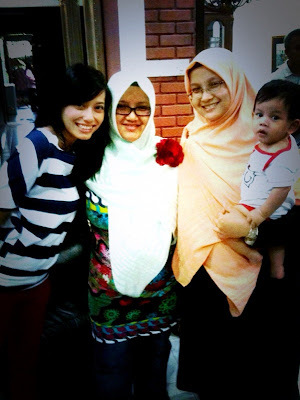 Dr Citra Mattar (centre) is a gynaecologist. I remembered smsing/calling her during my paranoid moments when I was pregnant with Nyla. She is a mother to a pair of adorable twin girls who are so so gabby gifted. Sukesy Mattar, on the other hand, is an educator and also a homeschooling parent to four boys. Nyla goes for weekly swimming lessons with Kesy's 3 older boys and she enjoys her Tuesdays with them very much. Everytime she has to part with the boys, she'd whisper to me," Mommy, today you homeschool me la so I don't need to go to school." I've always enjoyed my conversations with Kesy because she is truly the most nurturing, intelligent and positive person I've ever known! 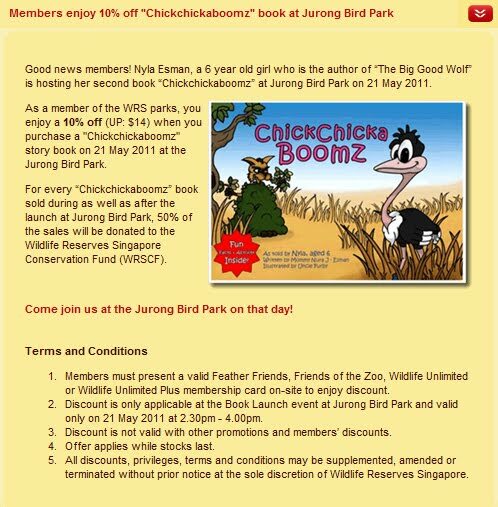 Now, you all know that Nyla's chirpy birthday party is this coming Saturday. I approached, in my personal opinion, the best cake expert I know of, Ayu, and yeah as expected she's fully booked. "Mommy, so I will not have a birthday cake is it?" Nyla asked. I scratched my head and told her to give me a few days. However, I really wanted her cake to be special. Ya I know. Sounds so wrong right?! Me baking. Laugh all you want. I will not get offended one. The thought of me being responsible for Nyla's birthday cake made me perspire buckets. As of now, my heart is beating so fast lor. So stressful man! Now, I know I cannot bake the fanciful cakes Ayu baked. So I had an idea and visualised how I would envision Nyla's birthday cake to be. A few weeks back, Kesy brought along some yummylicious cupcakes to the swimming complex. Someone who knows how to bake cupcakes! I shall make her my mentor. I approached her and expressed my desire to bake Nyla's cake for her birthday party. On top of that, I described to her in detail how I would like Nyla's birthday cake to turn out! Kesy is an adventurous kind of person. She's damn sporting one. She's so used to doing fun stuff with her boys indoors and outdoors so she was like,"Nura, come to my house and bake! Let's try!" Me: Nyla! Mommy is going to bake your birthday cake okay! Nyla: Don't bluff Mommy. You never bake. We don't have an oven at home. Me: Yah I know. We are going over to Aunty Kesy's house. She is going to teach me. Anyway, I went over to Kesy's house early in the morning for a trial baking session last Monday. Whatever she instructed me to do, I did. The icing was so so so yummy by the way. The sweetness really complements the vanilla cupcakes we baked. Nyla TOTALLY loved it. Woots. And Kesy and I were like "Yeah! We did it!" So there you go, nothing is impossible! Wanna see how the cake looks like? Please proceed to Nyla's blog! My mom and I were two of the mothers who celebrated the occasion in style through the lens of the gifted, prolific and much sought-after photographer, Maryann Koh. Maryann specialises in shooting elegant stills of pregnant ladies, newborns, toddlers and fun family portraits. Do click like on The Studio Loft's Facebook Page and ogle at the amazing photos, peeps. Really really awesome, I swear. Maryann has been featured on Channel News Asia on Asia Exposed as well as shooting well-heeled mommies such as Wong Li Lin. Impressive stuff. Maryann has such a laid back style, so relaxed and friendly, she made all 3 of us feel so comfortable and encouraged us to be ourselves. This is my mom's, Nyla's and my favourite photo! And, in celebration of Mother's Day, The Studio Loft is offering a special package for my blog readers. If you would like to enquire or schedule your appointment, do call Maryann of The Studio Loft at 6 235 3696. The day is nearing, peeps! I did something impulsive as you can see from the above picture. After I dropped Nyla off at school yesterday, I bumped into Joy (Nyla's classmate's mommy)and told her I wanna trim my bangs ala like 2 months ago. End up...my bangs were untouched. When I stepped into Abang Sam's hair salon at Novena Square, he asked enthusiastically,"Cut short is it?" From last time he aim me liao. Everytime he sees me, he'll psycho me to cut my hair super short and every single time, I would refuse, hence looking like the same old me (only slightly enhanced) when I exited his salon. So boring right me? I know. Story (and me) will get more interesting from now onwards, I assure you. Me: Ok lah Bang, I cut my hair short...Shoulder length can? Me: Huhhhhhhh. 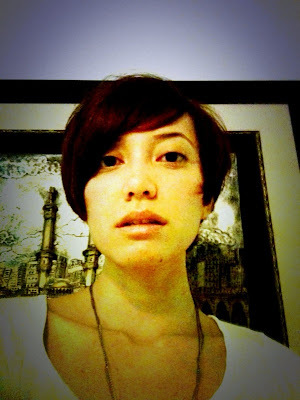 Are you DAMN sure I can rock the short hair look, Abang Sam? *He took his weapon and stood behind me. Him: Yes Nura. For a change...Just whack that fella. How? Yes or No? Me: Sigh Sigh Sigh...followed by a meek 'Yes. Me: WAILS! Aaaaahhhh! Abang Sam, SO FAST you cut! Him: You said yes what. Him: Too late, you must trust me okay, Nura. I was shaking man. Hahahahahah! The last time I had drastic haircut was in 1997 and my mom and dad refused to talk to me. And finally after 14 years, I did it again! Only that this time round, the babe refused to talk to me! Her jaw dropped when she saw me and kept asking me repeatedly why I cut my hair. 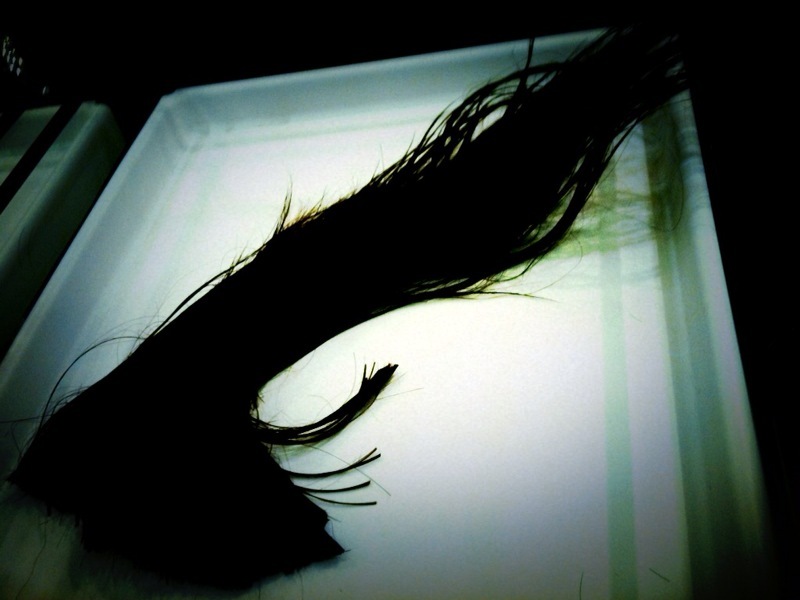 "We'll buy a long hair wig tomorrow." I don't know whether to laugh or cry when she said that. However, I have no regrets chopping my locks off. Don't mind ah, camera whoring at its peak especially after a makeover. My hair was too too dry. Looks like a horsey's tail here. Ladies, if you are contemplating a hair makeover, I highly recommend you to Abang Sam because he is....simply the best..lalalala. I'm serious. Abang Sam, if you are reading this, you have definitely given me the best haircuts. This man's got some magic fingers he can transform you to look effortlessly good. So, really... am not surprised that Abang Sam is a hairstylist to many local/ foreign celebrities and even royal families ! Do call him to book an appointment at 6 737 8095. 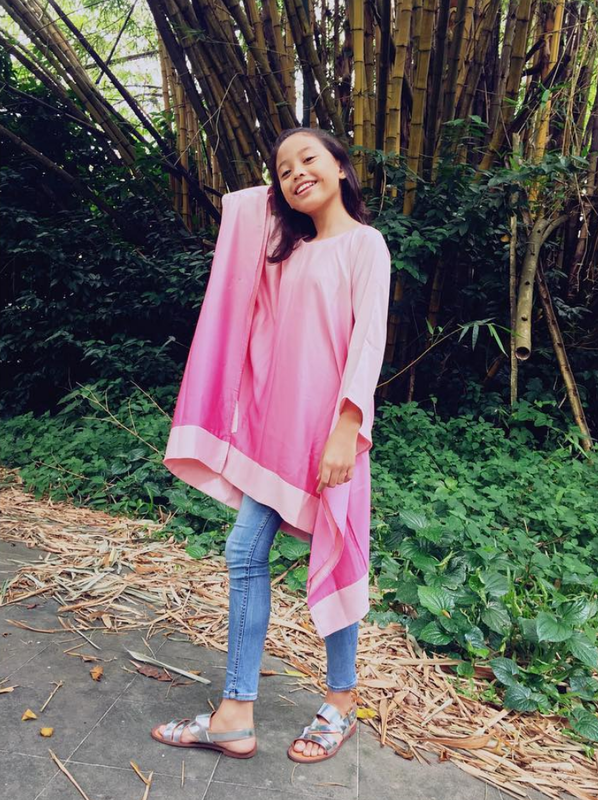 MUST REQUEST FOR ABANG SAM OKAY! Also do mention Nura J's Blog to him because my readers get to enjoy 10-20% off! I know this is way overdue and I thank you all for being so patient. I also hope that the Mother's Day weekend had been awesome for you (and your) mommies. I've come across a twitterette tweet this 2 days ago,"Every day should be Mother's Day. Not only today!" and I couldn't agree more with her. So to you 3 winners I am about to announce, should your mothers go 'Huh! Mother's Day is over already whaaaaaat! ', do kiss her and tell her that "Every day is Mother's Day, Mama...cos you're special like that." Okay without further ado, Harnie has chosen the deserving winners. 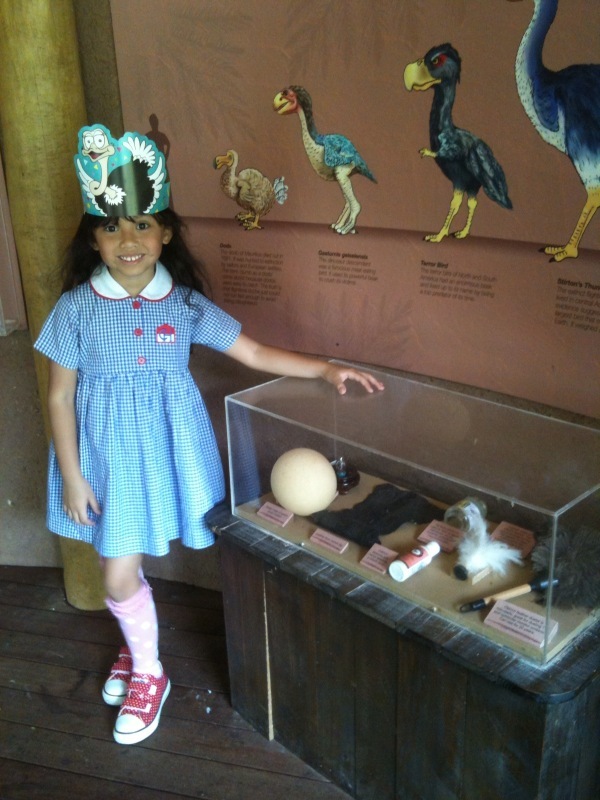 According to her, it wasn't easy because ALL the entries are very touching mouching. Anyway, here are the 3 winning entries. 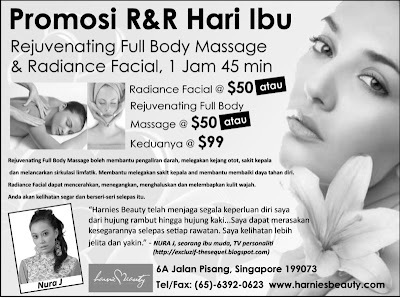 AND THE 1ST PRIZE (Whitening/Radiance Facial worth $120 OR De-stress Rejuvenating Massage worth $85) goes to AIDIL EDZWAN! The woman who deserves to be pampered is my mak.She taught me as much as she can even though she had primary education.She is my ustazah reciting the Al-Quran with me every night.She is my chef whose delicacies I savour at every meal.Her smooth palms soothes my fever whenever she touches my forehead.Her love for us is immeasurable & her to us dedication is beyond questions.Her anger is our pain & her happiness is our gain. A mother's prayer is a priority to the Almighty. We love you Mak. And to the rest of you, don't despair k!